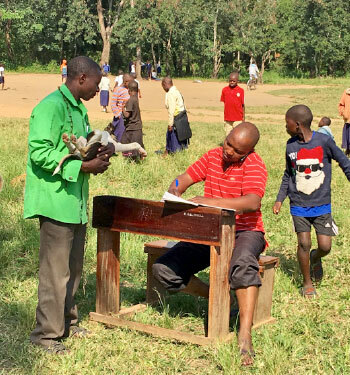 A note from the program organizer, Dr. Margarethe Hoenig: This program would not have been possible without the collaboration with Professors Muhairwa and Werema at the Sokoine Agricultural University Department of Veterinary Medicine in Morogoro, who were instrumental in the day-to-day organization. We thank Anthony Mhando and Dr. Nickson Ng’umbi and the local veterinary officer, James Nathan, for their daily assistance. We could not have done this without our wonderful drivers, Habby and Musa. 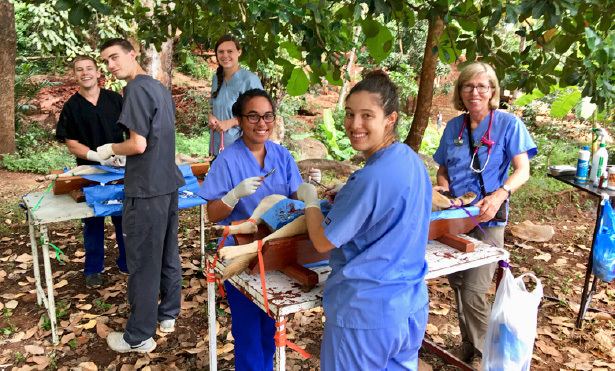 We gratefully acknowledge the sponsorship of Boehringer-Ingelheim Vetmedica and Henry Schein, who generously donated vaccines and surgical equipment, and are thankful for the financial support of Nestle Purina and the College of Veterinary Medicine at the University of Illinois. The program not only entailed “hands-on” population and infectious disease control by our students and local veterinarians but dog owners were also asked to complete a questionnaire with the help of the local veterinarian which will provide us with much-needed information about animal husbandry and awareness of methods of disease and population control for animals. 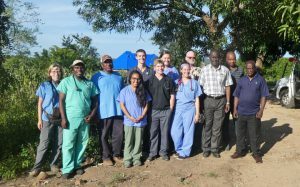 The Tanzania 2017 Illinois team members were Drs. Avery Bennett and Margarethe Hoenig and veterinary students Heather Bernardo, Brittany Cortina, Sara Pearson, Bryan Ernsting, and Jonathan Powers. It was our first day of the program, and we were all excited and nervous about starting. Our first stop after leaving the Arc Hotel was the veterinary school, where we met up with Dr. Nickson Ng’umbi, a veterinarian from the Sokoine University for Agriculture, and Anton Mhando, a veterinary technician. They showed us around the school’s surgical suites and explained a little about how a procedure would flow. While at the school, it was obvious how much of an impact this program has had over the years. Clinicians and past students who were involved with the program in the past would stop to talk with Dr. Hoenig and Dr. Bennett and tell us how excited they were that we were there. After consolidating and collecting our equipment, we headed out to sta rt our work in the field. At this point, I was getting really nervous. I had reviewed the procedures and Dr. Bennett had given us a refresher course on suturing and ligatures and instrument handling the day before, but none of us had any idea of what to expect when we arrived at our first stop. We stopped outside of a house with a shady front porch and a Coca Cola stand outside, and all of the sudden there was no time to be nervous anymore. We had to unload and set up everything we needed for any surgeries and vaccinations that we had for the day. I was chosen to do the first spay with Dr. Bennett. It went well, and Dr. Bennett was full of useful little tips and subtle tricks to help along the way. After that, the day felt like it flew by me. We learned very quickly that most of the dogs were not house pets and were not always the most cooperative for vaccination. Anton and “Dr. Nickson” were great at coordinating our efforts and acting as translators between us and the owners. We made it back to the Arc Hotel at the end of the day, sweaty and tired, but feeling accomplished with an incredible first day. We started our day by visiting the veterinary school and meeting with Professor Maulilio Kipanyula, who is the dean. He gave us a presentation about the Sokoine School of Agriculture College of Veterinary and Medical Sciences. This is the only veterinary school in Tanzania. He is a very progressive dean and the school is actively growing. He expressed how much they appreciate the coordinated effort of this program with the University of Illinois. It brings a lot of positive attention to the veterinary school. They have a multitude of master’s and PhD programs at their school as well as long-term plans of starting a medical school. Their veterinary program is very public health–based and research-focused. Many of their research topics and issues are very similar to what is pertinent to research at Illinois as well. Their current goal is to build a clinical skills lab similar to the one at the University of Illinois. Dr. Chacha Werema, who is a professor at the veterinary school, came to Champaign 2 years ago to visit our Clinical Skills Learning Center and create ideas for his home university. When we met him, he asked right away how the Illinois volleyball and football teams were doing. After our meeting at the university, we went and set up in the same place where we were the previous day. There was a man who brought a bunch of puppies in a basket on his motorcycle. They were so cute! Even though we didn’t speak the same language, it was obvious how much he cared about his puppies. He spent the whole day waiting and watched every surgery. We all got good practice doing pediatric surgeries. Another man came with a truck bed full of dogs, which all received vaccinations and were dewormed. When we returned to the hotel, Dr. Bennett gave us a lecture on helpful tips and tricks for suturing. The day had, quite literally, a rocky start. A bus had gotten stuck in the mud road in front of the Arc Hotel and Habby, our driver, had to take us a different route out. It looked as if it had rained overnight, so the road was extra bumpy. We drove across railroad tracks, through tight roads, and over steep ditches to get to our next location at another district veterinarian’s property. It was a nice gated area next to a small creek with plenty of shade. There were also a hodge podge of animals on site, including cattle, ducks, and the tallest chicken any of us has ever seen (it stood well past my knee!). 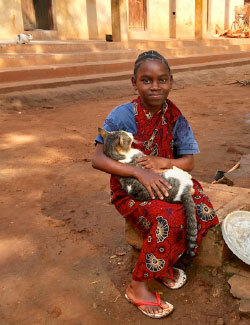 We also met Tanzania’s youngest cat whisperer. She was about 12 years old and the only one in the area who was able work with the cats on site. Thanks to her cat whispering skills, Jon was able to perform his first spay and I was able to do my first cat neuter. We took a short break across the street of our next location, the official headquarters of the district veterinarian (I think). We received news that there was only one dog neuter available since owners were having trouble catching the other dogs. Dr. Bennett had warned us ahead of time that it was pointless to ask how many surgeries would be performed each day. Sure enough, one dog neuter turned into multiple vaccinations, dog surgeries, and even a couple more cat surgeries. By the end of the day we were hot, sweaty, and ready for refreshing glasses of passionfruit Fanta back at the Arc Hotel. We woke up earlier than our usual time this morning and left the hotel at around 6:45 am. Everyone was excited because today we were off on a field trip to visit APOPO, a Belgian NGO based in Tanzania. 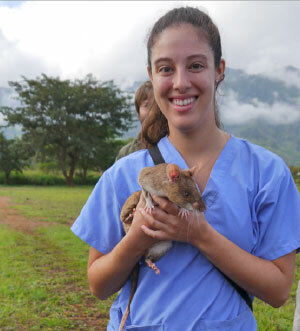 Their goal is to train the African pouched rat to sniff out landmines and help with tuberculosis detection. We arrived at APOPO at the same time as the bus carrying all of the rats. The first order of business for the morning consisted of the APOPO staff weighing each rat in a basket attached to a scale. We then followed them out to the “land mine” field for their daily training session. The rats are trained to detect the scent of TNT through the use of clicker training and positive reinforcement using bananas as treats. Training involved having the rats on a harness and walking them between the two trainers up and down the field. Metal tea balls with the scent of TNT were buried in the dirt throughout the field and each time the rat found one it was rewarded with some bites of banana. As the rats improve overtime the difficulty of the fields increase and metal tea balls are replaced by mines. We later moved on to the TB detection unit and were able to observe the rats in action. APOPO receives positive and negative labeled sputum samples from local TB clinics around Tanzania and heat inactivates the samples so they are not contagious. The rats then screen the samples by sniffing them and signaling those that are positive. If a rat detects a sample that was originally labeled negative because of test results from the routine screening procedure, the sample is re-evaluated in the lab with more specific testing and if detected positive the hospital is contacted so they can link the sample to the correct patient. Watching the rats in action and learning about APOPO’s mission was a pretty amazing experience. After wrapping up our tour of APOPO we returned to the Arc hotel for some breakfast and then we were off to the field! Today’s location was the house of a preacher. We arrived and quickly set up our work stations as we were all excited to get started. We did a total of 11 surgeries and many more vaccines. The preacher, whose name was Good Luck, was very generous and welcoming to us. We were treated to freshly boiled corn for lunch picked from the field next to the house. It was interesting that the taste of the corn was so different from the sweet corn of Illinois. Instead this corn was very dense and extremely filling! As we finished up our day we ended by passing out toys to the children who watched us all day long. They were so grateful for the stickers and balloons we gave them and saw us off by waving goodbye for as long as we could see them. For the first few days in Africa I would get an omelet or scrambled eggs for breakfast and they would come out completely white. I had assumed that they were just using egg whites; maybe they were just cholesterol-conscious. right? I did eventually see an egg being cracked and it revealed a ghost white yolk. It turns out that because the diet of the laying hens in Tanzania differs so much from that of our layers, the yolks are an entirely different color. After our breakfast of white omelets, we left to start our last day of work in Morogoro. We drove up into the mountains today, where we got a welcome relief from the heat of the previous days. We set up our tables in an idyllic spot next to a flowing stream with fruit trees overhead (see photo at top). It was a shorter day because we were leaving for our next destination in Mikumi in the afternoon, but still we performed six surgeries. The human-animal relationship is, of course, much different in Tanzania than it in the United States. We got another reminder of that when the owners of a medium-sized male dog were unable to restrain him for vaccines and sedation for surgery. The owner was nearly bitten and decided that his dog was not going to be up for a procedure that day. The dogs there were used for security and for hunting, but they were rarely companion dogs and were not used to being handled like dogs in the States. Challenges in restraining the patients were just part of the adventure, though! We started our drive to Mikumi from Morogoro around 2 p.m. The main highway in that part of the country is also one of the only roads, and it connects Dar es Salaam, Morogoro, Mikumi, Iringa, and several other major towns and leads to Zambia. The highway cuts right through Mikumi national park, the fifth largest national park in Tanzania. That is definitely less than ideal because it puts the animals at risk of being hit by any one of the trucks speeding by. There are the beginnings of plans to move the highway further south to bypass the park, but I believe they are in the very early stages still. The road planning did mean, though, that we got one of our first glimpses of African wildlife. In the 50 km stretch through the park, we passed baboons, warthogs, giraffes, elephants, and impala. Baboons on the road became a common occurrence. It turns out that as the population of the country grows, more roads are built, and just as it is in the U.S., human population begins to encroach on wildlife. The baboons have realized that they have better luck stealing food from stands on the street, rooting through garbage, or asking for handouts than in the wild. So as a result, the behavior of many of the country’s baboon troops has changed so that they live closer to the road. Today we left early in the morning for a safari at Mikumi National Park. The drive to the park was a little chilly in our open topped safari vehicle. 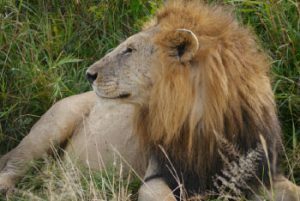 After checking in at the park entrance, our guide, Samuel, quickly caught wind of a lion-sighting nearby. Little did we know today would be the day of lions! While peering at a lioness and her cubs through the heavy grass and trees, our driver got a call and immediately we sped away. We were all curious where we were going and why he was driving so fast but as soon as we arrived we understood exactly why. Right in the middle of the park road were five lions, so close you could almost touch them. After spending a good amount of time taking pictures and enjoying the sight of the lions, we made our way to an airplane landing strip where we saw male impalas and warthogs crossing. In the distance, we caught glimpses of an elephant herd. Samuel perfectly predicted the elephant herd’s movement so that they arrived right where we were parked at the landing strip. It was an amazing sight as the herd slowly emerged from the tall grass. 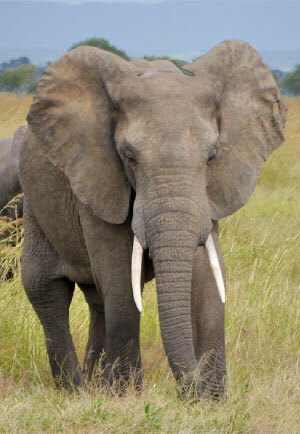 It made us realize just how well-hidden animals (even those as large as elephants) are camouflaged in this environment. During our animal adventures, we also took a break to climb one of Africa’s signature trees of the savanna – the baobab. This particular baobab was large enough for all of us to be in the top branches at the same time. In fact, four of us fit onto one low-hanging branch and it made for a great photo opportunity. While hanging around the baobob tree, it started to drizzle a little, but we were lucky enough that it stopped and stayed relatively cool for the rest of the day. 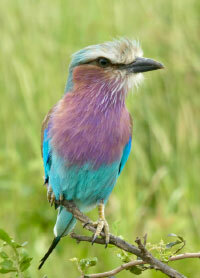 Our luck continued and we saw herds of Masai giraffes, impala, zebra, eland, wildebeest, cape buffalo, jackals, a nile lizard, bush bucks, vervet monkeys, so many colorful birds like the lilac-breasted roller, and even more lions! Just as we started our visit by watching lions by the road, we took one last stop at a lioness we had spotted earlier protecting a dinner of warthog for her cubs. As we left the park, we watched the sun set behind the mountain range. It was a beautiful end to an unforgettable day. This morning we all made sure to have a hearty breakfast before heading off for our hike of Udzungwa Falls. We had all heard so many stories about it and were a little worried about what we had coming for us. Habby picked us up and drove us about 2 hours to our check-in point, and soon after we were standing with our guide at the start of the trail. By the time we made our first stop at one of the waterfall lookouts, we were all already exhausted and dripping sweat… Little did we know we were not even close to being halfway there! Along the hike our guide pointed out different types of trees used for medicinal purposes such as GI or reproduction. We also got lucky and saw several monkeys (blue monkeys and red, as well as black and white colobus monkeys) swinging in the trees along the way. After a couple hours of hiking, we finally made it to the top of the Sanje waterfall! We all took a nice break to relax and have some lunch. Dr. Hoenig had requested our usual lunch, pizza (or pea-zza: pizza with peas on it), to be wrapped up in foil so we could bring it along. We got lots of great pictures of the amazing view and then it was time for the descent. We followed our guide and Dr. Hoenig, the best hiker of us all, down the path and across a drawstring bridge as we slowly made our way down. Once at the base of the falls, we were allowed to go swimming, but were warned it was very, very cold! Being the adventurous crew that we were, though, we decided we could not pass up this once-in-a-lifetime opportunity. They were not wrong when they told us it would be cold! What we were hoping would be a refreshing dip in the falls was a very cold ice bath. After a little while the hypothermia kicked in and it didn’t really feel that cold anymore. 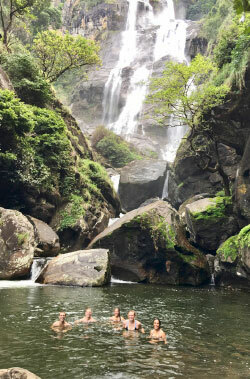 Swimming in the falls was an unbelievable experience, though, and by the end we were all cold, laughing, and so glad we had elected to jump in! Exhausted, we continued our trek to the end of our trail where, thankfully, Habby was waiting to pick us up! We collapsed into his car and were ready for the drive back to our hotel. Ironically, our guide, who was wearing dress shoes and a button-down shirt, did not look like he was at all fazed by the day’s hike. We were all in disbelief! After an amazing weekend, we were ready to get back to work in the communities again. 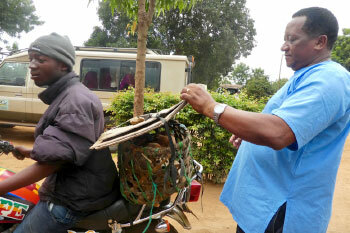 James Nathan, the district veterinary officer, joined us and coordinated our efforts with the communities. His personality and organizational skills made him an incredible asset to us during our week in Mikumi. Our first site was under the shade of some trees next to a soccer field, and there were people and their animals ready and waiting to be seen. By this time, we were running pretty smoothly as a group and fell into an efficient rhythm. Dr. Nickson started calling Jon “Mr. Flea Spray” while Jon was in charge of applying the anti-flea and tick spray, and Dr. Hoenig was of the opinion that we could open a high-volume vaccination clinic with ease after our experiences. As the morning progressed, the number of kids watching us work started to grow. They were concerned for the animals and always curious and watched what we were doing. Dr. Bennett offered them a chance to listen to the heartbeat of one of the anesthetized dogs. At first, the kids were either too shy or nervous to try. Eventually one of them plucked up the courage to try it, and after that there was a line of kids crowding around the table to take a turn. The look of concentration mixed with wonder on some of their faces was priceless. Today we set up near a school, so when we arrived we had a large group of people. Many were waiting for surgeries and vaccines. The rest was a huge crowd of kids who wanted to watch the surgeries. Anton, the veterinary technician, was a hit with the kids. When I looked over they were swarmed around him and I couldn’t even see him. He was telling them things to ask us so they kept running up to us to ask questions amongst lots of giggles. There were herds of cattle and goats grazing near us. Some of the cattle had the biggest horns I have ever seen. One of the men who brought his dogs for surgery was an animal scientist. He was explaining to me how the British breeds of cattle do not do as well in Tanzania because they are not heat resistant. We were also comparing ticks in the U.S. vs. Tanzania. They have a huge tick and tick-borne disease problem as well. Today Dr. Nickson was full of jokes. He spent the day quoting Disney movies. I think he can quote entire movies and we learned his favorite is “Finding Nemo.” At the end of the day we gave out stickers to the children. They were big fans of the stickers. After we returned to the hotel, we vaccinated the hotel owner’s dogs, including an adorable Rottweiler puppy named “Rex.” Overall we did 15 surgeries today and administered over 80 vaccines. Today I learned that many of the dogs in Tanzania are named “Simba,” which means “lion” in Swahili. Our day started at an old, abandoned train station that was built by the sugarcane industry to transport product. It was an interesting location that would have been almost eerie if it wasn’t for the buzz of people and dogs eagerly waiting for us when we arrived. It was a unique setting for a day filled with unique cases. We saw our first case of transmissible venereal tumor (TVT). She was a dog spayed during last year’s trip and her vaginal tumors re-emerged. Dr. Bennett took the masses off and in the process taught us the Parkson-Kerr oversew pattern. We also saw our first dog with visible oral papilloma warts and crushed those for the owner. I got a surprise pregnant dog spay, and Bryan learned how to do a scrotal ablation on a dog whose testicle had adhered to the scrotum after a previous dog attack. One of our last cases was a suspected blocked dog. The owner had mentioned the dog hadn’t been acting right and was leaking urine after being attacked by another dog. The dog’s bladder was as large as my head and couldn’t be expressed. Dr. Bennett stuck an 18-G needle and, with the help of Dr. Ng’umbi, relieved the bladder. 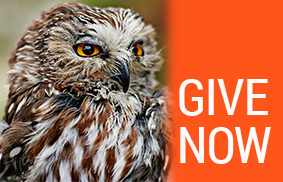 Unfortunately, we couldn’t do more for the dog but urge the owner to take him to the veterinary hospital for surgery. The day ended with us handing out stickers and toys to the remaining kids. They especially liked the foam footballs that Sara brought once she taught them how to throw them. Back at the Tan-Swiss, we re-visited the owner’s dogs to give them ivermectin, and we were treated to free drinks at dinner as thanks. Heading to breakfast this morning we are all pretty much in shock that this is our second to last day of the program. We are so used to our routine of waking up and heading to our breakfast buffet at the Tan-Swiss and then hopping into Habby’s truck to start the day’s next adventure that we don’t want it to end. Today’s location was near a small school, and when we arrived there were already long lines of people and their dogs waiting for us! It was looking to be another busy day so we set up our tables and got to work as quickly as possible. We split up into two rotating teams to tackle the crowds. 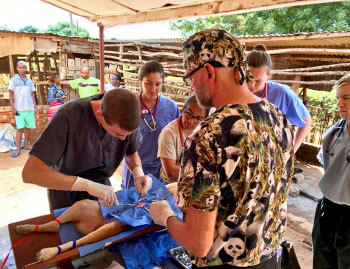 While most of us worked on surgeries, one of us would help Dr. Nickson and Dr. Hoenig with vaccinations in order to keep up with the demand. We managed to complete 15 surgeries today in addition to an innumerable amount of vaccinations. We have provided so many vaccines, especially in the last few days, that we were now running low and had to start cutting back in order to have enough vaccines left to provide to our surgery patients. After packing up our supplies, we spent a little time handing out small toys, stickers, and balloons to all the schoolchildren. We made it back to the Tan-Swiss Lodge with time left to relax and enjoy the pool before dinner. We all are still in awe that we only have one day left of the program. It seems to have flown by, but I feel I have gained so much knowledge and confidence with the help of Dr. Bennett. It has truly been a privilege to work with him and get to know him, and this trip will be the most memorable of experiences of fourth year. Tonight we had our farewell dinner with the team to thank them for all their help. We were joined by professor Muhairwa and were finally glad to meet the person who had sent us our invitation letters and arranged the program. Dr. Nickson Ng’umbi, the technician Anton, our driver Habby, the local veterinary officer James Nathan, and the driver of the vet truck, Musa, all joined us for dinner as well. Dr. Nickson played some songs on his guitar, including Dr. Hoenig’s favorite song ‘Jambo, Jambo.’ Dr. Nickson had personalized the lyrics for our group, and we all sang along. It was such a fun, yet bittersweet, night with all our newfound friends! This was our last day of work on our trip. It was a strange feeling because, after months of planning and anticipation, it felt like our time in Tanzania had come and gone in a blink. But by the end of the day we realized just how much we had actually learned and changed in that short time. The first piece of news for the day as we were on our way to the site was that we were out of xylazine, that critical sedative and analgesic component in our xylazine/ketamine surgical anesthesia combination. The only replacement in town was diazepam. We know diazepam most commonly as being used for seizure control in our animal patients in the U.S., but apparently it can also be combined with ketamine for surgical anesthesia when there are few other options. As we pulled away, we all knew that we had learned invaluable skills and grown a better appreciation for the difficulties that other areas of the world face, those that are so different from our own. In order for that combination of drugs to be effective they need to be administered intravenously. The dogs of Tanzania are not house pets, and as we’ve mentioned they are very difficult to restrain safely, especially for something as delicate as finding a vein. And because the drugs are very short acting, it also meant they would have to be re-administered multiple times during surgery. Giving the initial injection proved to be very difficult and, because we knew we would have to give multiple doses once we started the procedure, it left us few options other than to place IV catheters in all of our patients. This was a daunting challenge considering how difficult the dogs were to restrain and also because the only muzzle we had was broken. My competitive side was also disappointed because I figured that it meant we would be moving much slower than we had been and would not get the 10 surgeries done that day to put us over 100 total for the trip. But I was happily proved wrong. The first few days of the trip we managed to get 5 to 7 surgeries done each day. The last day of the trip, even with the anesthetic obstacle, we did 16. It was pretty amazing to see that our skills had improved to where each surgery took half the time they had the previous week. I think our overall dexterity was better because we were able to get catheters in all of the patients. There was one dog who wasn’t very happy being held and was moving his leg pretty enthusiastically, and I swear, Sara reached her arm around Anton (the Tanzanian veterinary technician) and put the catheter in the vein underhand and backwards. At the end of the day we passed out the last of the toys: balloons, stickers, sunglasses, and kazoos. The children were polite and overly grateful. Yet another reminder of how little they have and how much good we can all do in developing countries. As we pulled away, we all knew that we had learned invaluable skills and grown a better appreciation for the difficulties that other areas of the world face, those that are so different from our own. We all believe that this trip really does a lot of good for the students as well as the Tanzanian people in the towns we visited. We hope that it can continue so future students can share in similar experiences. Thank you, Dr. Hoenig and Dr. Bennett, for your hard work on the trip, patience with us, and the knowledge you passed on.